This regulation requires all professionals who sell processed, unpackaged foodstuffs to provide information for consumers about the allergens contained in their products. 14 allergens are affected: peanuts, celery, crustaceans, nuts, gluten, sesame seeds, milk, lupin, molluscs, mustard, eggs, fish, soybeans, and sulphites. This regulation reinforces information on fishing methods and the origin of products from the sea. The label must indicate the scientific name of the fish in Latin, the fishing gear used, and the catch area or sub-area where the fish was caught. 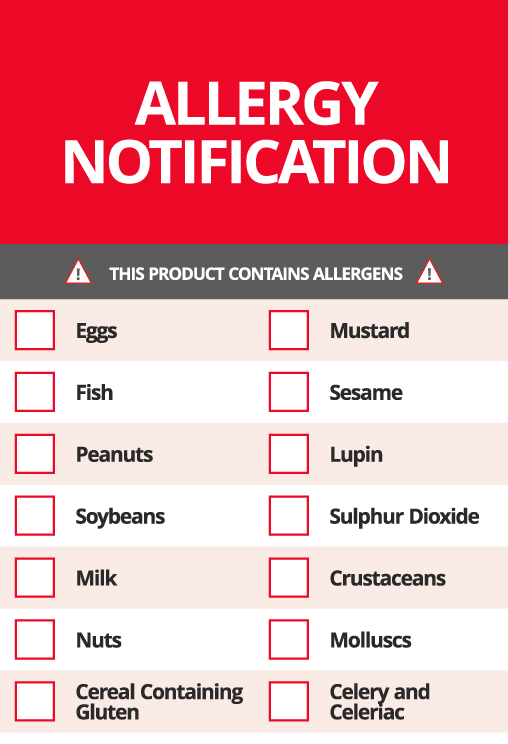 Labelling of food is becoming increasingly important and to keep up with this demand we have a new product which will fulfil the needs of our customers - food allergen labels. These Labels will comply with the new regulations that have been set out by the EU; included in the label will be a list of all the 14 allergens including peanuts, celery, crustaceans, nuts, gluten, sesame seeds, milk, lupin, molluscs, mustard, eggs, fish, soybeans, and sulphites. You will be able to mark on the label which food in included that that may result in a allergic reaction and caution your consumer. We have available generic labels, which can be used in any business or store and also bespoke personalised labels which are personally designed for your company with your logo included. that deals with ingredients and food. With a warning message clearly visiable at the top of the label, it will protect your company and consumer. product is the best starting point for you. As well as all the features above, our personlised Labels have everything you need plus the added bonus of being personalised to your company. We can add your logo to the label and make it fit in with your companies colour scheme and your company image. for more infomation about personalised labels, please contact us.